Dark Ages Romance: Discover the romance of Dark Ages Britain: DAWN OF WOLVES - release date announced! DAWN OF WOLVES - release date announced! 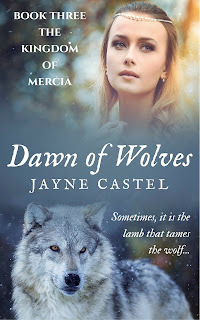 DAWN OF WOLVES (Book #3, Kingdom of Mercia) now has a release date! Published by Kindle Press, the novel will be available to purchase on Amazon (Kindle and paperback versions) on August 23, 2016. However, if you voted for the novel on Kindle Scout, you should already have received your Kindle copy! Pre-order your Kindle copy from Amazon now. The novel tells Wulfhere and Ermenilda's story. He's an ambitious Mercian prince and she's a pious Kentish princess. Actually, they were a real historical couple - a marriage between a wolf and a lamb - although this telling of their story is entirely my own. Here's the Prologue for you to enjoy. Ermenilda watched the snow fall. The delicate flakes fluttered down from a darkening sky like apple blossoms caught by a gust of wind. An ermine crust covered the garden’s gravel paths and frosted the plants that had not died away over the winter. Damp, gelid air stung Ermenilda’s throat, and her fingers were numb, but still she lingered. As always, she was reluctant to leave her refuge. She circuited the path between the high hawthorn hedge and the frosted sage and rosemary, her boots sinking deep into the snow. Despite the cold, she had ventured out here to escape the oppressive atmosphere of the king’s hall, which was full of greasy smoke and the reek of stale sweat. Outdoors, the air tasted like freshly drawn cider. Better yet, she did not have to listen to the prattle of women, the booming voices of men, and the squeals of children bored with being cooped up indoors. Ermenilda loved this secret spot; it was her sanctuary. Her father had told her the Romans built this garden, and that it was a crumbling ruin when he had first come to live in Cantwareburh. Since then, his wife had poured her energy into restoring the secluded space. As soon as she could walk, Ermenilda accompanied her mother to the garden, as did her younger sister. Even over the winter, the three women spent most afternoons out here—the garden was a passion they all shared. At the far end of the garden, Ermenilda paused. There, she admired the snowy branches of her mother’s prized quince tree. As she gazed upon it, a veil of melancholy settled over her. Soon, I will have to leave this place. Nervousness fluttered just under her ribs, replacing the sadness, before giving way to a lingering excitement. Ermenilda had heard that Eastry Abbey also had a magnificent garden. Once settled there, she would no longer miss this one. She was hoping that her father would let her take her vows at Eastry in the spring. He had been noncommittal whenever she raised the idea, but she had time to convince him yet. Dusk closed in, but still Ermenilda lingered. It was only when a shadowy figure emerged from the arbor, at the opposite end of the garden, that she realized she had been missed. Cloaked head to foot in fur, her younger sister hurried down the path toward her, her face rigid with purpose. Ermenilda sighed, irritated that her sister had shattered her solitude. “I’ll come in soon enough,” she replied, waving Eorcengota away. Ermenilda’s irritation grew. She hated it when strangers arrived at her father’s hall—especially if they were ealdormen, for she did not like how some of them leered at her. A knot of apprehension formed in Ermenilda’s belly. Unlike her silly goose of a sister, she did not like the sound of this visitor. Her father would be delighted of course; they rarely hosted royalty from Britannia’s other kingdoms. The Kingdom of the Kentish often appeared of little importance in the wars, politics, and intrigue among the others who ruled. Ermenilda reluctantly fell into step with Eorcengota, following her out of the garden and through the apple orchard. The trees were naked this time of the year, their bare, spidery branches dark against the swirling snow. Ahead, the outline of the Great Hall loomed. A high, timbered structure with a straw-thatched roof, it sat raised above the surrounding garden, orchard, and stables on great oak foundations. The hall cast a long shadow in the gathering dusk. Shaking snow off her cloak, Ermenilda climbed the wooden steps to the platform before the doors. She nodded to the spearmen guarding the entrance and pushed the heavy oaken door open. Then she entered, with Eorcengota following close at her heels. Just inside the door, she almost collided with a group of men who were in the process of removing their cloaks and weapons. Ermenilda realized with a jolt that these must be the Mercians. They were dressed for traveling in thick fur cloaks, leather jerkins, woolen tunics, and heavy boots. It appeared they had tended to their horses swiftly and entered the hall just ahead of the princesses. Ermenilda feigned calm, shrugged off her fur cloak, and handed it to a waiting servant, aware that curious male gazes had settled upon her. She did not want to look their way but, against her own will, felt her gaze drawn to one of the men. He stood near to her, little more than an arm’s length away. The moment their eyes met, her breath rushed out of her—as if she had just tripped. She had never seen a man so striking, so coldly beautiful. His eyes, ice blue, held her fast. His face was so finely drawn it appeared chiseled, and his long, white-blond hair fell over his broad shoulders. He was a big man, and she had to raise her chin to meet his gaze. The newcomer was dressed in leather armor and had just finished unbuckling a sword from around his waist, which he handed to a servant. “Good eve, milady,” he murmured. The sound of his voice, low and strong, stirred something in the pit of Ermenilda’s belly—a sensation she had never felt before—an odd kind of excitement mingled with fear. “Wes þū hāl,” she responded formally, trying to ignore the fact that her breathing had quickened. The man’s gaze remained boldly upon her face, an arrogant smile curving his lips. Her father’s booming voice saved her from having to converse with him further. King Eorcenberht of Kent strode across the rush-strewn floor, sending servants scattering in his wake. He was a huge man, in both height and girth, a great fighting man in his youth. A thick beard, the color of hazelwood, covered his face—the same shade as the unruly mane, streaked through with gray, that flowed over his broad shoulders. Physically, his daughters—both slender and blonde like their mother—bore no resemblance to Eorcenberht. The blond man tore his gaze from Ermenilda and favored the Kentish king with a cool smile. Something in the way the man spoke the words made Ermenilda feel flustered, as if she had done something wrong. Glad to be free of the Mercian’s penetrating stare, Ermenilda cast her gaze downward and hurried away. As always at this hour, the king’s hall bustled with activity. A handful of servants were finishing preparations for the light evening meal—a supper of griddle bread, pickled onions, salted beef, and cheese—as the household ate their largest meal at noon. The servants had put out long tables where the king’s thegns would take their meal, while the king and his kin dined upon the high seat. Eorcengota caught up with her sister. They made their way toward a long worktable next to the nearest of the two fire pits. They joined their mother, Queen Seaxburh, upon the high table where she was pouring mead into cups. “Fæder’s guests are here,” Ermenilda announced. She picked up another clay jug and began helping her mother. There was no missing the acerbity in their mother’s voice. Ermenilda saw her glance in the direction of the newcomers and glimpsed a flash of hostility in her mother’s usually serene eyes. Ermenilda glanced back at the blond man, who was now making his way across the floor. He appeared to be listening attentively while her father talked to him. She knew that her grandfather—King Annan of the East Angles—and her uncle, Jurmin, had both fallen three years earlier in battle against the Mercians. It had taken place in the marshes at Blythburgh, in the borderlands between Mercia and East Anglia. Her mother, who adored her father, had been inconsolable when she learned the news. Seeing the look on her face now, Ermenilda saw that the grudge her mother bore Mercia ran deep. Not that Ermenilda blamed her. She cast a dark look at Prince Wulfhere and prayed her father send him quickly on his way. Ermenilda had listened to many a tale about ruthless King Penda around the fire pit at night. The violent pagan, who would stop at nothing to expand his borders, had died in battle against Northumbria two years earlier, but that had not stopped the stories about him. At least Fæder will not wed me to a pagan, Ermenilda assured herself as she finished filling the cups. Eorcenberht was a god-fearing man who, just a year earlier, had overseen the destruction of all the pagan idols in Cantwareburh. He also had insisted that the town observe Lent, the period of fasting after Ēostre. Ermenilda sneaked a glance at the Mercian prince as he stepped up on the high seat. Frankly, despite his good looks and charisma, this man frightened her. He was different from her father, who was loud, bluff, and easy to read. The prince appeared to be a man who said little and thought much—she did not trust such men. Taking a seat at the table upon the high seat, to the left of her mother, Ermenilda was disconcerted to see that their guest had sat down at her father’s right—the spot usually reserved for his eldest son, Ecgberht. Prince Wulfhere was sitting directly opposite her, and she realized there would be no escaping his gaze during the meal. Servants placed wooden boards, piled high with food, upon the table. Ermenilda watched Prince Wulfhere help himself to a generous serving of bread, cheese, and salted pork. The king watched him, smiling. Ermenilda stole a glance at her mother. The queen sat still and silent, hardly touching her food. The joviality on her husband’s face was absent upon Seaxburh’s. “Not exiled for much longer, if I have anything to do with it,” Eorcenberht replied, raising his cup high into the air. The prince fixed him with a cool, level gaze. The queen visibly paled at this, her grip on her bronze cup tightening. Ermenilda had never seen her mother so incensed. Yet, the king appeared oblivious to it. Heedless, he continued. The prince nodded and smiled. Ermenilda watched their conversation with a growing sense of unease. She knew that the Northumbrian king, Oswiu, had held control over the Mercian stronghold of Tamworth for the past year. The Northumbrians had controlled southern Mercia ever since the murder of King Paeda, last Ēostre. It dismayed her to hear that her father was now involving himself in matters that did not concern him. If this exiled prince failed to retake the Mercian throne, there would be consequences for Kent. Still, a woman’s opinion mattered little when it came to politics, so she kept silent. Likewise, the queen held her tongue, although Ermenilda could see it cost her to do so. The meal progressed, and the conversation shifted to other things. The king complained about the bitter winter that lay upon them and then asked the prince about his exile. “How have you managed to escape capture?” he asked. The prince smiled at this. It was the first truly warm smile that Ermenilda had seen him give. Ermenilda suppressed a shudder; this man was most definitely a pagan. There was something wild—dangerous—about him. As if sensing her reaction, Prince Wulfhere looked at her. Their gazes met for an instant, and Ermenilda saw his naked interest. Heart pounding, she looked away and stared down at the remains of her supper. Ermenilda glanced up, shocked by her father’s admission. She had been sure he would agree to let her join the nuns at Eastry. Of the two sisters, she was far more suited to such a life. Eorcengota was too spirited and silly to enjoy life as a nun, whereas Ermenilda craved quiet and solitude. “Would you consider wedding her to me then?” Wulfhere asked. Ermenilda watched her father’s face and knew the offer had delighted him. However, he did not reply immediately. Instead, he leaned back in his chair and fingered the elaborately carved armrests while he mulled the request over. She glimpsed a shrewd glint in his eye and realized he was calculating something. “It depends on two things, Lord Wulfhere,” he replied eventually. The Mercian put down his cup of mead and returned the Kentish king’s gaze, his expression unreadable. Ermenilda slowly let out the breath she had been holding. Her father’s conditions had made her relax slightly. Wulfhere’s father had flatly refused to be baptized, and she wagered that his son was cut from the same cloth. Plus, taking back Tamworth from the Northumbrians sounded like a difficult task at best. Perhaps a life at Eastry was not lost to her after all. Unfortunately, Wulfhere’s next words shattered her hopes. He glanced first at Ermenilda and smiled, although his eyes were hungry. Wulfhere’s gaze met the king’s once more. His gaze flicked back to Ermenilda, and she wilted under the heat of his stare.